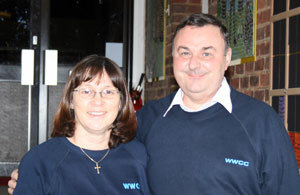 The West Wycombe Chamber Choir was formed by Barry and Michèle Hodkinson in April 2006. Barry is Musical Director whilst Michèle is Choir Manager and handles all the administration. The choir is delighted to have Lady Lucinda Dashwood as its patron. The choir is for everyone, experienced and non-experienced singers, everyone has something to offer and develop, and so we will grow together and cultivate our own unique style. We hope to cover a wide range of music anything from Bach to Beatles. To provide a local choir where experienced singers and those who just like singing can enjoy singing together. To put on recitals and concerts locally to raise funds for local causes and charities. To promote the social side of the choir enabling members to make new friends. We welcome all singers from beginners to very experienced. There is no audition necessary but you must bring along plenty of enthusiasm and commitment to practice. The choir rehearse on Wednesday evenings at the West Wycombe Combined School, West Wycombe Village. We start at 7:45 pm and finish at 9:45 pm. Socialising often takes place afterwards in a local hostelry. The charge is £48 per term (= £4 per week) and there are 3 terms in a year, each ending with a concert. We aim to provide 12 rehearsals per term; some of the rehearsals may be structured as sectionals. The first rehearsal is free so that you can try us out.